Upgraded items are fairly common, and are denoted by their name being colored, as opposed to a normal item’s white. In most cases when an upgraded item is crafted or dropped from a monster, it will appear unidentified. When you identify an upgraded item, you will see certain words added to the item’s name, both prefixes (Such as “Superior”), and suffixes (“of Smoke”). Each prefix represents the number of added stats on an item whereas the suffix represents one magical property on the item. For example Superior items have only one or two added stats while Legendary and Artifact items may have many extra stats and are much rarer in occurrence. Identification scrolls can be used to determine an unidentified items properties. There are three different scrolls with increasing ability for identification. More expensive scrolls are able to identify more statistic points on items. During game-play you will find and collect items from killing monsters and looting dungeons. Many of these items will be of no immediate use to you so you may either; sell them, salvage them or simply leave them on the floor. If you choose to salvage these items you will extract one of two properties, an Essence or a Design, which you may then use to upgrade a similar item. To salvage an item you must locate the NPC that knows this craft for one of the three item types. When salvaging you will extract either an Essence or a Design from the item. There is a cost in Gold Coins to pay to salvage an item. This cost is based primarily upon the level of the item. Volume = Represents how full the vial is. A vial full of Essence will have a greater chance of succeeding in upgrade. This also changes the prefix of the item name. Purity = Represents the lack of impurities of the Essence inside the vial. A higher purity will improve success. This value is similar to item level. Slag = The leftovers of salvaging can sometimes be left in the vial, this slag will cause problems when upgrading items. Quality = Represents the quality of the original item. A poor quality design is not going to be much use! This also changes the prefix of the item name. Detail = Represents how detailed the design is. The more detail you have the better chance of copying over those rare qualities. This value is similar to item level. Fade = Sometimes the drawings of a Design can be quite faded. This will affect item quality and result in poorer results. To upgrade an item you need one Essenc, one Design of the specific item type, and the item you wish to upgrade. Open you inventory (F9) and select the blue hammer icon in the bottom right of the inventory panel. This will open the upgrade window and can be done in any location at any time. All items that are upgraded first lose all their stats. This means that if there is a failed upgrade, the item will become normal, if successful then the old stats will be replaced with the new. 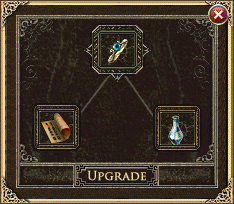 Place the Essence, Design and item you wish to enhance into the empty spaces of the upgrade window. Select upgrade and pray for success. If successful the box around the item will glow and give you an unidentified item. 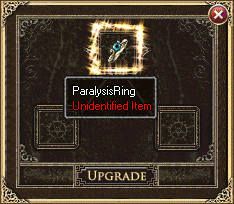 If unsuccessful you will be left with a normal item with a white name. Upgrading items with this system will never break an item but will always consume the Essence and Design.